THE BRITISH RAILWAY STORIES LTD: "34055, Fighter Pilot"
I have a friend who is very much a Southern Region fan, so hopefully this blog post will go someway to redressing the "Eastern Bias" somewhat!!! 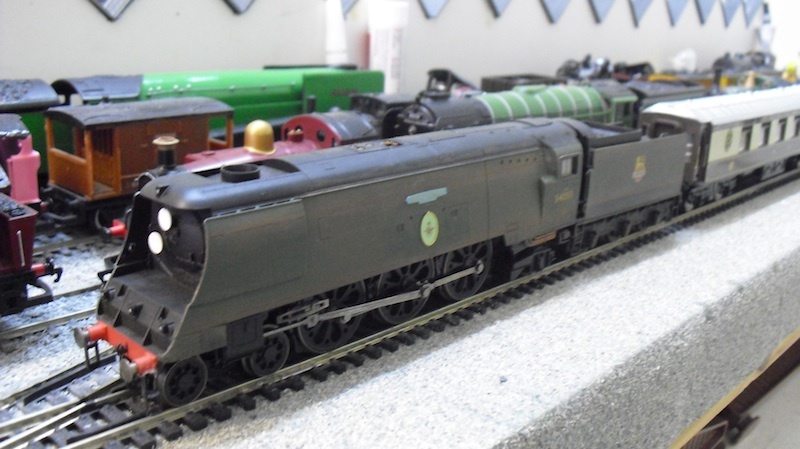 I've had a Hornby Watersmeet West Country model for some time. The reason behind buying it was originally for use in a friend's university project. 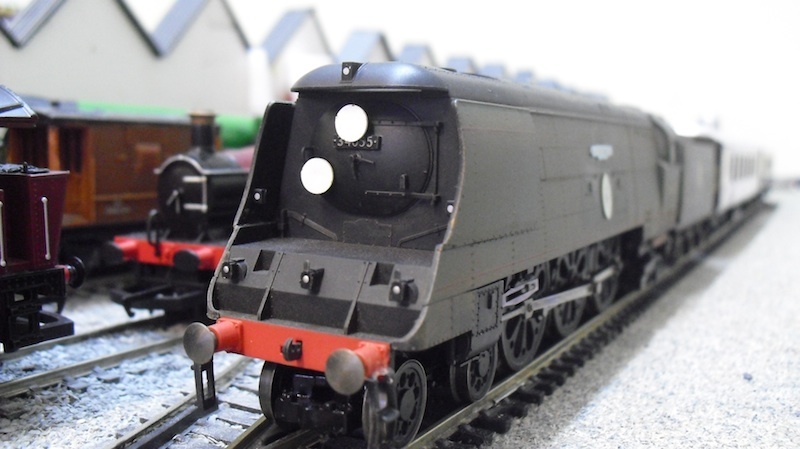 I did a mockup of his project using a Dapol kit instead, in the event, and this loco has sat around doing nothing for a number of years. Then I had a brainwave - I wanted to model real life, preserved (barely!) 249 Squadron as I think it should be rebuilt - caprotti valve gear, giesl ejector and various other additions. So the nameplates and number came off Watersmeet, and I bought the nameplates and numbers accordingly. 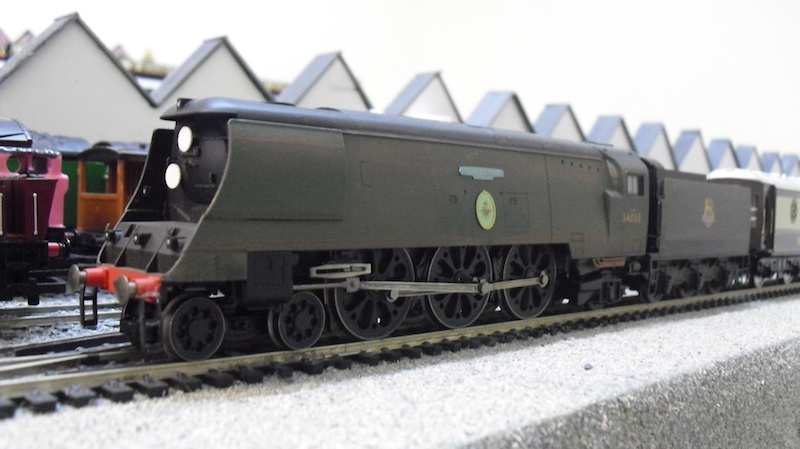 Unfortunately...not being aux fait with the Bulleid Pacifics as much as I'd like, I had neglected to check which cab/tender combination 249 Squadron had. as it happens, Watersmeet is only suitable for certain light pacifics, and not 34073. D'oh! 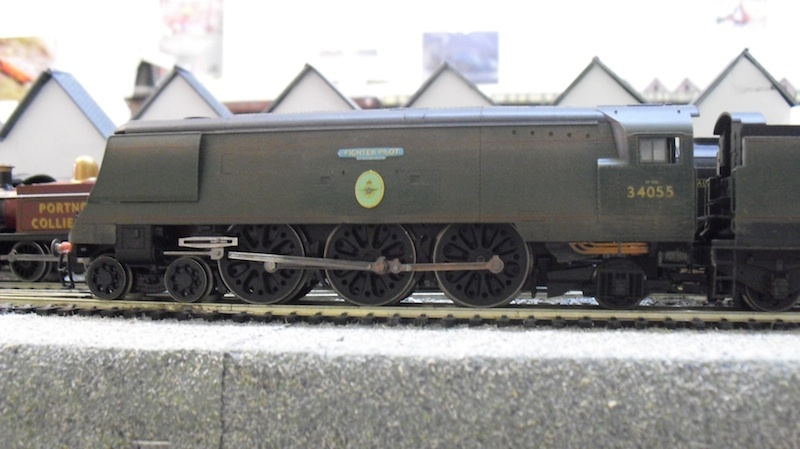 However, a change of heart with the name and the numbers led me to recreate Brighton favourite 34055, Fighter Pilot (a malachite green model of which was my father's third ever model, and resides in the cabinet above the desk). The headcode is specific to our home town and railway line - the "Dartford Loop" as it is called, and hopefully is not too unrealistic to be noticed at a rivet counter's level! I removed the nameplates using a scalpel, and remove the Hornby printed West Country plates at the bottom using careful rubbing with some varnish remover and a cotton bud. I then weathered the body and tender using Tamiya weathering powders - combinations of mud, gunmetal and rust to keep the green apparent but create a working engine thereafter. I then sealed the weathering using Gamesworkshops' extremely useful "Purity Seal", with careful and light coats of the latter sealing the weathering and making the overall appearance darker. Fox Transfers nameplates were applied prior to weathering, the number plate and cabside numbers applied prior to weathering. The result is as seen above. Mind, I removed the body from the chassis to do the weathering - I am going to weather the chassis of both loco and tender separately, as I want to make this a fairly decent representation of a working locomotive.